Experience the beautiful nature of western Norway which includes fjord, mountains and waterfalls. You will be impressed! Deep fjords, sheer mountains, mighty waterfalls and powerful currents! This spectacular tour from Bergen takes you up the 27-kilometer long Osterfjorden in Hordaland province. Innermost in that deep fjord is Modalen, the second smallest municipality in Norway with about 380 residents. 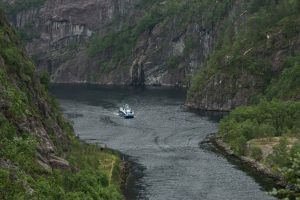 Underway, the fjord narrows between the steep mountains as you are brought safely through the strong currents of the shallow and narrow Mostraumen strait. You’ll also see waterfalls that can give your face a really refreshing shower at times of peak water flow! The boat will sail right up to a waterfall to catch a bucket of ice-cold mountain water for you to sample before turning back in Modalen and retracing the route through the magnificent landscape. This is an optional add-on activity/package. Depending on your booked trip, an additional night in Bergen might be required. The package price will appear during the regular tour booking process. Modern, comfortable boats with sundecks. There is a kiosk on board where you can buy hot dogs, soft drinks, wine/beer, coffee/tea, chocolate and more (it’s not allowed to bring your own drinks and food). Audio guiding in several languages. Duration: 3 hours. Departure from Zachariasbryggen next to the Fish Market. Included: 3 hour fjord cruise from/to Bergen with audioguide in several languages on board. Difficulty level: Suitable for everyone. The fjord cruise to Mostraumen can be added to many of our tours. The cruise is available all year round! Depending on your booked trip, an additional night in Bergen might be required. The package price will appear during the regular tour booking process. Beautiful nature of Western Norway! Modalen – the second smallest municipality in Norway.